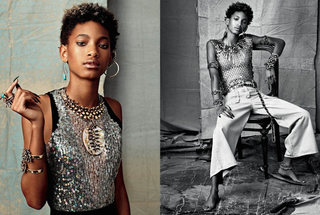 Musician and quantum physics enthusiast Willow Smith is featured in the latest issue of CR Fashion Book in a regal photoshoot. The 14-year-old philosopher also outlined her 2015 goals, which includes learning Krav Maga and capoeira and wearing dreads. "I just want to have dreads. I want to embrace my full self, as natural as I can be... I think my look changes all of the time, and right now it's a bit more messy, kind of grungy." More photos from the shoot below.